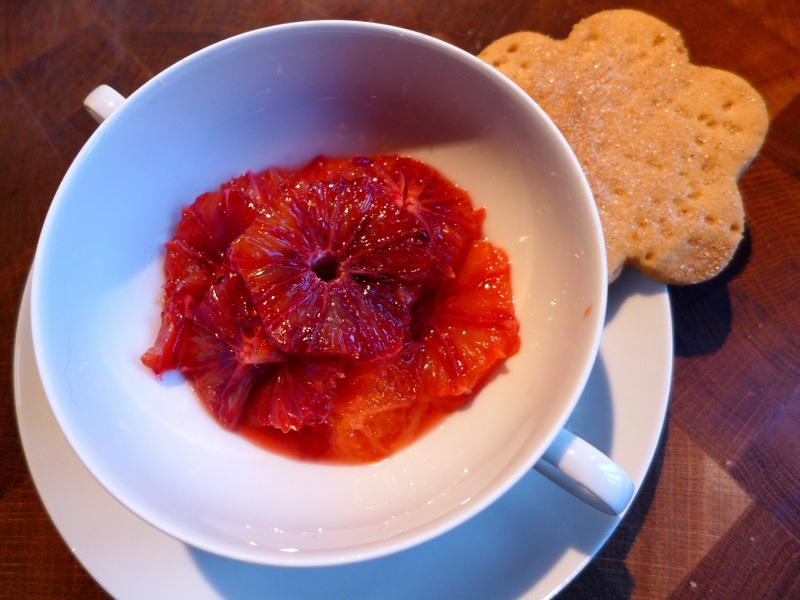 I could cheerfully eat my own not inconsiderable body weight in blood oranges, they’re such a seasonal treat. Straight out of the fruit basket, sliced up with other citrus for breakfast, baked into cakes. This, though, makes a refreshing dessert, particularly good if you want something light at the end of a hefty meal. As it’s pancake day you could also try the oranges spooned over some thin, lacy crepes. Neither the caramelised oranges nor the shortbreads take long to make but you do need to patient with the caramel. Whatever you do, don’t stir it, otherwise you’ll have candied clumps of sugar and no sauce. On a large plate, slice the top and bottom off six of the oranges and cut down with a sharp knife to remove, in sections, the peel and every scrap of pith. Slice the oranges horizontally as thinly as you can, flicking out any pips, and place in a bowl. Reserve the juice on the plate and add the squeezed juice from the scraps and the remaining oranges until you have 100ml. Strain and set aside while you make the caramel. Tip: using a light-coloured pan helps you to track the progress of the caramel – it’s much harder to judge its done-ness if you use one with a dark non-stick coating. 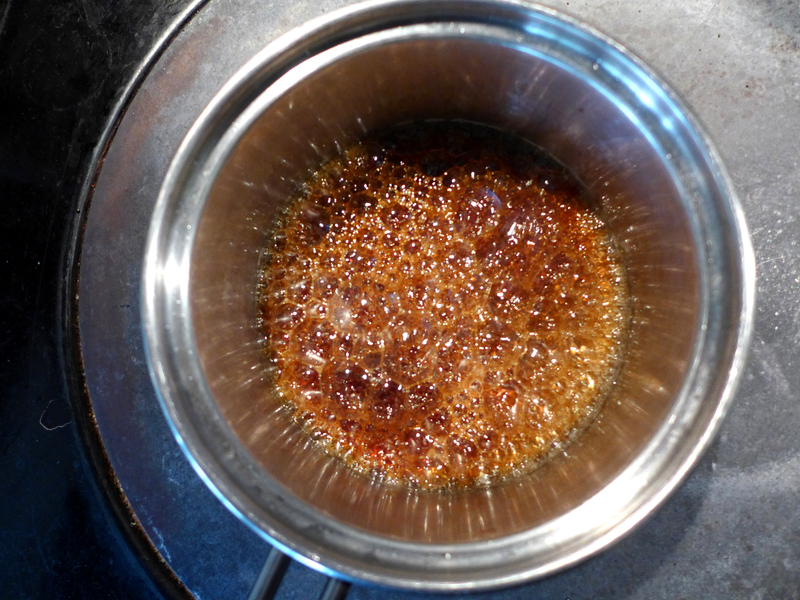 Put the sugar with 3 tbsp of water on a medium heat and stir until the sugar has dissolved. Turn the heat up and leave it alone until it has turned a deep amber. You can swirl the pan – not too much or half the sugar will end up crusted to the sides – but don’t stir. Standing well back (it will spit) add the juice to the caramel and stir until it is smooth. Allow to cool, standing the pan in an ice bath if you want to speed things up. It will thicken as it cools. Divide the orange slices between four small bowls and pour over the caramel. 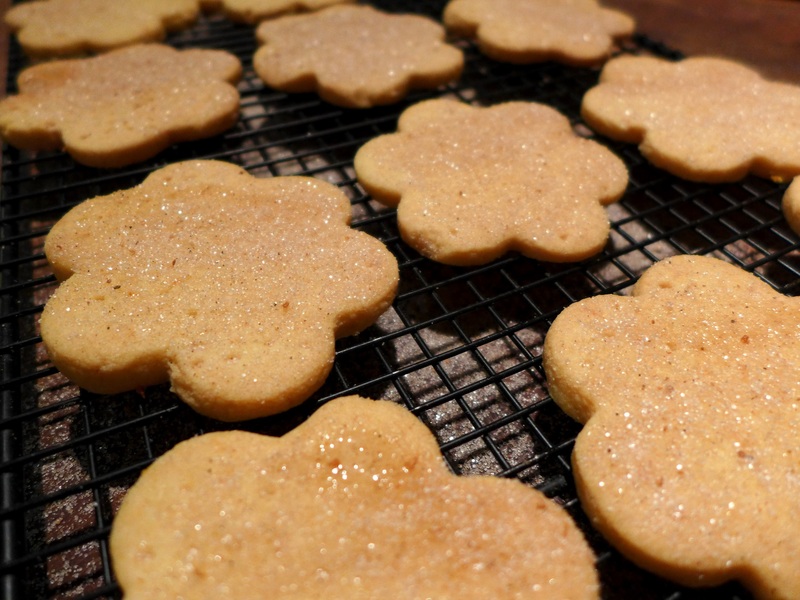 Chill until needed, then serve with the orange shortbreads. Sift the two flours together in a large bowl. Grate over the orange zest and stir to distribute evenly. In a separate bowl, cream the butter and sugar together until soft and fluffy. Put the mixture in with the flour and work together with your fingertips to make a smooth dough. Pat or roll it out until it’s 5mm (1/4″) thick, and cut into your desired shapes, re-rolling as necessary. Place on an ungreased baking sheet and prick all over with a fork. Put the shortbreads in the middle of the oven and bake for 10 minutes, then turn the temperature down to 160C/325F/Gas Mark 3 and bake for another 10 minutes. Keep an eye on them, they should be pale in colour, not brown. 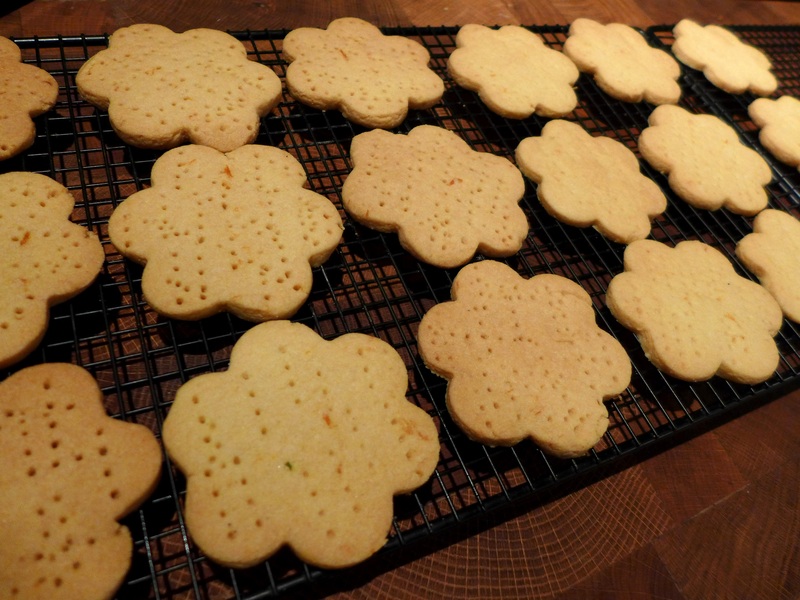 Let the shortbreads cool on the baking sheet for five minutes then transfer to a wire rack and allow to cool completely. Once cold, brush with a little egg white and dust with caster sugar or orange sugar (granulated sugar ground up with some dried orange zest). You can mix a very small amount of orange flower water in with the egg white but proceed with caution otherwise it’ll taste like soap. This entry was posted in Desserts, cakes and biscuits, Fruit, Vegetarian and tagged caramelised blood oranges, orange shortbreads by Linda Duffin. Bookmark the permalink. By me, one of the best things about your blog is the way it inspires me to try again foods I have dismissed in the past. These oranges look delicious; thank you so much. Thank you! So pleased you like the look of them. Very elegant. If I made the biscuits, I would eat them all. Not good. But, delicious. I love the idea of having the oranges over thin crepes, and of course a big dollop of sweetened mascarpone! Yum! I am with you, we’ll eat the whole Sicilian blood orange crop together! Having them in biscuits, genius. Oh no! 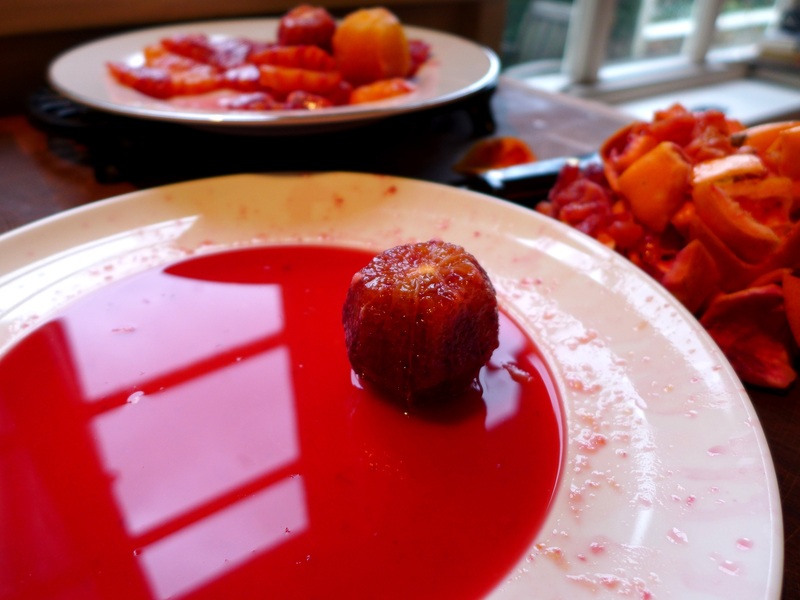 Blood oranges have already gone AWOL round here. Perhaps because I bought the lot when they were available….. I found some in Waitrose today, a variety I hadn’t come across before called Ippolito, from Spain. Huge! Haven’t tried them yet. Oh, how I love the blood oranges, too. We’ve honestly had no winter here this year (I wouldn’t complain, as I loathe winter, but, well, you know, it is rather distressing). Anyway, I fear I mostly missed the wonderful citrus, too. What a lovely dessert. Oh yum. I don’t think I have every had a blood orange. I feel as though I should fix that problem. Making the caramel looks beyond me but it all looks delicious. Love the dramatic photo with the window reflection!